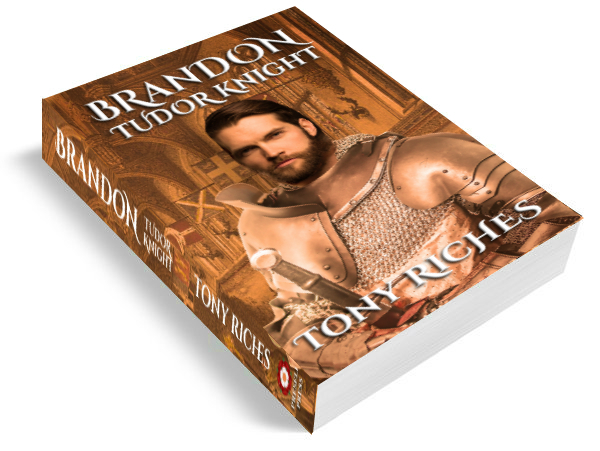 When Mary died her French income ceased and Brandon found himself back in debt to the Crown. 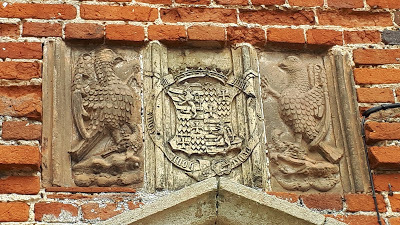 He was soon remarried to his young ward, the wealthy heiress Catherine Willoughby, and his Suffolk manor and house were taken over by royal trustees in 1535. An inventory of the property taken three year later in 1538 records a moated house of brick decorated with terracotta panels, built round an open courtyard one hundred and twenty-six feet square. The main range of the house on the eastern side was approached from the west over the moat by an arched bridge, the lower parts of which survive to this day. ‘All the wyndowes of the said place be at this present well glassed, and all the walls of the same of bricke and imbateled, leyed over with playster cheker wise white and blake, and all the houses covered with tyle, the gatehowsse and the towers covered with leade’. A feature of the house was an internal corridor with windows overlooking a large central courtyard. 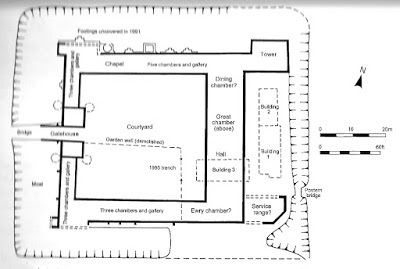 On the south side were four main rooms, linking at the east end with the service rooms at the lower end of the Hall. The east range contained the Hall, measuring some seventy feet long, with mullioned bay windows onto the courtyard, with service rooms and five other rooms over which was the Brandon’s Great Chamber, with large bay windows to the east and west. A dining chamber overlooked a garden to the east, which is thought to have been designed in the French style, like those Mary would have known in the royal palaces of Paris. A tower and private chapel (where Mary lay in state from 25 June until 21 July, 1533) formed the north eastern corner. In 1988 trial excavations were undertaken to establish the accuracy of the earlier descriptions and measurements, principally by examining the gatehouse. Part of the cobbled floor of the gatehouse was exposed, as well as part of the inner courtyard. 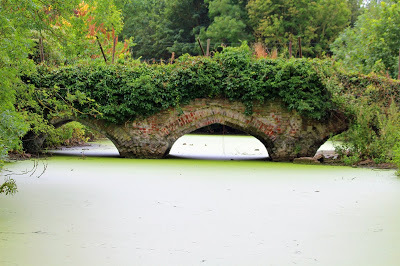 Exploratory trenches were excavated on the inner edge of the moat adjacent to the bridge. These revealed the walls of the southern half of the gatehouse, which appeared to be twenty-two feet square. The walls varied from 60 to 90cm in width and were built up on three courses of brick footings. This building was bonded into the moat wall. Another trench was dug next to the southern arm of the moat, with the intention of finding the wall of the outer court. The moat wall was located and at its eastern end it was built over by several later walls. At its west end the moat wall formed a straight join with a wall made of re-used Tudor building materials of terracotta, glazed floor-tile and brick. The pottery recovered was mostly early to mid 18th century, coinciding with the final phase of occupation, although several Tudor sherds were found. Quantities of roof tiles and two sizes of brick were also found. Amongst these were fragments of moulded bricks, including a moulded mullion. Green-glazed floor-tile was found in the gatehouse and red-glazed ones were re-built into a later wall. 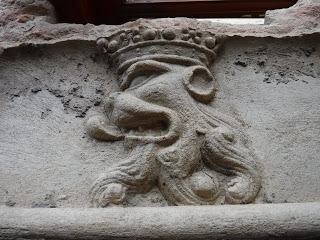 Much terracotta was discovered, confirming the extensive use of terracotta decorations as described in the demolition account. Several pieces, including a panel and a capital, were found in the gatehouse area. A large fragment of a window mullion was recovered and many small fragments of roll mouldings and panel were found. Westhorpe Hall moated site and associated fishponds were scheduled in July 1999 under the Ancient Monuments and Archaeological Areas Act 1979 and deemed to be of national importance. The listing states that the moated site of Westhorpe Hall is of particular historical importance because of its association with Charles Brandon and his wife, and the surviving descriptions of the great house which he built here show that it was an outstanding example of early 16th century domestic architecture. The listing adds that evidence recorded in limited excavations on the site and in the desilting of part of the moat, in addition to the remains visible around the central platform have demonstrated that the monument retains much archaeological information concerning this house, including a large quantity of architectural and decorative terracotta. After living with every detail of Mary and Charles Brandon’s lives for the past four years it was amazing to walk in their footsteps over the Tudor bridge which they crossed so often. The village of Westhorpe is a beautiful place and although it is a shame the Tudor manor house was demolished, I am grateful to Patrick Barker for his time and allowing me full access to such a fascinating site. The transition through history of dwellings is so interesting. Especially the ‘stuff’ that is abandoned.